Heterodontosaurus skull (top) and skeleton (bottom). Heterodontosaurus ("different-teeth-lizard") was one of the earliest ornithischian dinosaurs. 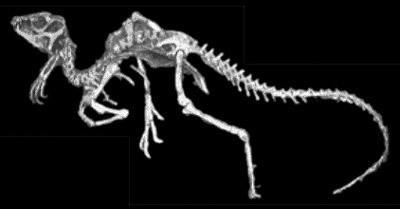 This lightly built, bipedal dinosaur was collected in 1966 from the 200 million year old Lower Jurassic Upper Red Beds, Stronberg series, on the northern slopes of the Krommerspruit Mountain near Voisana, Republic of South Africa. It is in the family Heterodontosauridae. Study of the skull has suggested that Heterodontosaurus had the capacity for biting, tearing, and grinding with its three kinds of teeth. On the image of the head at right, notice a canine-like tooth at the front of the jaw and more molar-like dentition towards the back. 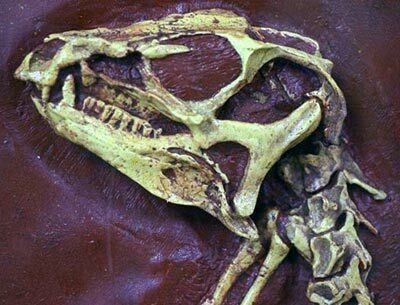 Heterodontosaurus may have had a cheek area to store food, the way some mammals do. Heterodontosaurus is one of several ornithopod dinosaurs; its relatives include Iguanodon and the hadrosaurs.